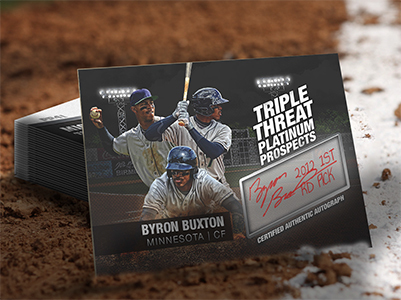 2013 Onyx Authenticated Platinum Prospects Series 2 gives collectors an affordable way to get some of baseball's top prospects. With a checklist that combines several top picks from the past couple of drafts with other standout prospects and key international stars, the release covers a broad spectrum. Every 2013 Onyx Authenticated Platinum Prospects Series 2 Baseball box includes six pack. Every pack comes with an autograph and two additional cards. Signers in the set include Miguel Sano, Byron Buxton and 2013 first round picks Jonathan Crawford, Hunter Harvey and Jason Hursh. 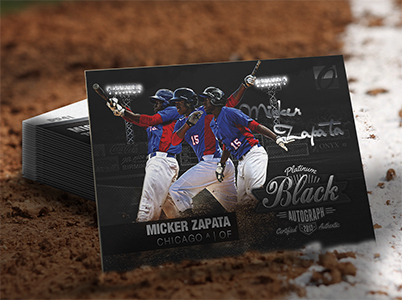 MLB.com's #2 international prospect, Micker Zapata has his first autograph cards in the set. Buxton, Sano and Zapata have special Triple Threat Autograph cards that have Silver, Gold, Green, Blue and one-of-one Red versions. These specially designed cards include images of the players batting, running and fielding, showcasing their multifaceted talents. 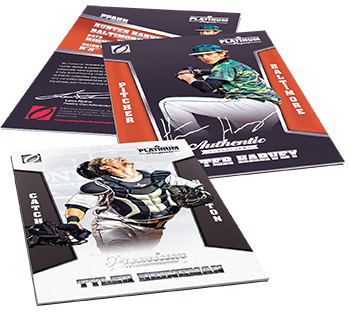 Metallic inks are one of the trademarks of Onyx Authenticated card products. These give autographs some extra pop and make the cards more distinct. All 2013 Onyx Authenticated Platinum Prospects Series 2 Baseball come numbered. They also have QR codes on the back. Once scanned with a smart phone, they take collectors to the Onyx site. It has exclusive content and links to other Onyx products and game-used memorabilia. The following is a preliminary list of signers for 2013 Onyx Authenticated Platinum Prospects Series 2. Not exactly sure what to make of this product. I either got the mother of all 6 box cases or something else. I hit 2 buxton autos one to /18 and the other to /5. there was only one base buxton. Only 1 auto in the whole case was was not gold or silver and numbered. I must have hit 6 zapata’s, no sano’s and those 2 buxtons. many repeats of names though. Also some of the cards are not cut to the same dimensions. they also waste a ton of packaging for these. If you have broken this product you know what I mean. I’ll give it 3 stars because of the bigger hits and the possibility I had a hot case.